You may know this is my favorite holiday, as I once had a pet groundhog whose name was Charlie. To read more about that, just click here. Or type "groundhog" in the search box. Reccommended block for this holiday: Sunshine & Shadows! 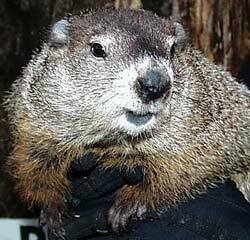 If you are watching the weather predictions today, be sure you get one from a real groundhog, not a prarie dog. European readers will want to consult a hedgehog. I would love to know what animals our friends in Africa, Australia and Asia look to. Antartica is a real puzzle. I just finished this baby quilt, made from the remaining Blue & White 9-Patch blocks I received when I was guild president...about 10 years ago! I made two larger quilt tops from the other blocks...they are in the pipeline to be basted soon. This one will be a donation to the guild's community service project. I had a nice remnant of fleece, and decided to use it for the backing and batt both, just one layer. Yes, you can spray baste onto fleece! Cherry-cherry helped me baste several quilts, and this was the first fleece one she'd done. I am sorry to say, Blogger does not want to connect to my picture files right now, so we'll have to take up the story of this quilt tomorrow! Quilt Show: Amelia Island "Quilts By The Sea"
Quilter's alert: UFOs are landing!